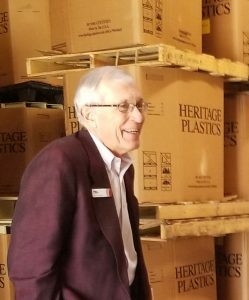 We were not surprised to learn that Union Rescue Mission in Wichita has named its new administration center after outgoing Executive Director Denny Bender. A passionate advocate for people who need a little help getting on their feet, Denny led the agency to construct the Eagles Wing, transitional housing for people coming out of homelessness, which had its ribbon cutting on Friday. “This was Denny’s vision and it wouldn’t have happened without his leadership,” said Union Rescue Mission board president Bobby Seacat. Denny also had a vision for employment, thus our relationship with him. We’ve been honored to help URM start an online book business that gives people the opportunity to work. St. Vinnie’s staff were on hand Friday and also got to see the new expanded warehouse for their book business. Terry McDonald and Bethany Cartledge from St. Vinnie’s had the chance to thank Denny for his wonderful work and meet the new executive director Doug Nolte. Welcome, Doug, to the Cascade Alliance and thanks Denny for your always inspirational work.